It took me a long time to discover Sensational Alex Harvey Band (with or without Alex). I'd owned albums by MSG, Nazareth and Greg Lake among other that featured various members of the band for quite a few years, and heard several recommendations, before actually purchasing anything by the SAHB. In fact it took a HMV sale for me to take a chance and pick up three CDs (on the rather dodgy Samurai label - a company that didn't pay the band any royalties for the releases) in the late 80’; ‘Framed’, ‘Next’ and the slightly confusing cover version filled ‘Penthouse Tapes’. Though I played the discs a few times they didn’t really ‘do it’ for me and joined the growing lines of rarely played five inch digital archives of times past on my bedroom wall. I’d heard my first live cover of a SAHB tune at a Christmas gig by Pallas in Aberdeen at the tail end of 1986 but it was the introductory track at the first solo Fish show I saw three years later that the strength of writing really struck me. The show opened with Faith Healer and I didn’t even realise it was a SAHB track at until I heard someone mention it. 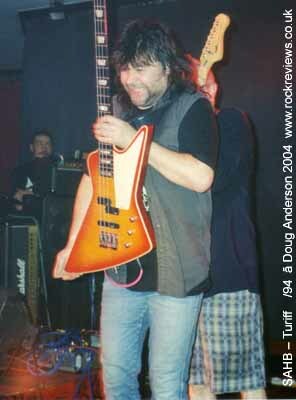 Roll on another year and I had witnessed the SAHB rhythm section (bass player Chris Glen(n) and drummer Ted McKenna) providing an extremely solid backing to Ian Gillan on his ‘Naked Thunder’ tour in August 1990. It was during Black Night at what is now The Forum in London that their power hit me fully in the stomach as they provided probably the best live version of the track I’ve heard. Three years on again and the boys had sort of reformed as The (Sensational) Party Boys. They’d played around the central belt of a while with guest singers including Dan McCafferty of Nazareth and the aforementioned Fish but the only chance I had to see them was as openers (or maybe second – they were on as we walked down the cliff road into the open air swimming pool) at the Tarlair Festival on the outskirts of the small fishing town of Macduff, just across the water from where I spent seven years as a wee lad. It has to be said it was a strange venue for a festival and not the warmest of summer days but the Party Boys seemed to be keeping people warm. The highlight for most of the early birds was probably Fish joining the boys on stage for one song at the end of their short set. A couple of the Party Boys, Chris and Ted IIRC, returned the favour during the Fish set. With the initial Glenn/McKenna combination eventually attracting Zal and Hugh McKenna back to the fold and fans asking for more SAHB tracks in the set the time was right for as much of a reunion show as was possible after Alex died in 1982. Thus later in 1993 with the help of Party boy singer Stevie Doherty they played some shows and recorded a new live album with a heavier edge to the old tunes, an edge more in line with the Gillan and MSG sound that 70’s SAHB. The following year they expanded their range and hit Elgin and several other towns within easy travelling distance and after the first show I was a fan having discovered what I’d missed first time round on those CDs. I initially planned to write my own review of the Aberdeen show below as it coincided with the tenth anniversary and had the benefit of me having some photos of Chris with a cake my then girlfriend baked for him. I couldn’t find those photos so a review will have to wait but I did find some I took at the Turriff show a few weeks later. I do have one review for you though, written by a musician friend and published originally in his company magazine, Out of Control. 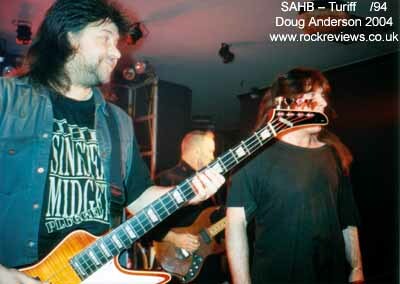 SAHB - London Borderline 1994? This page is Copyright © Doug Anderson 2000 - 2004. Created: 27 February, 2002. Last updated: 15 November, 2002.